We just learned about the Phoenix Crown of Empress Xiadouanxian. Another ancient Chinese sculpture is the He Zun. 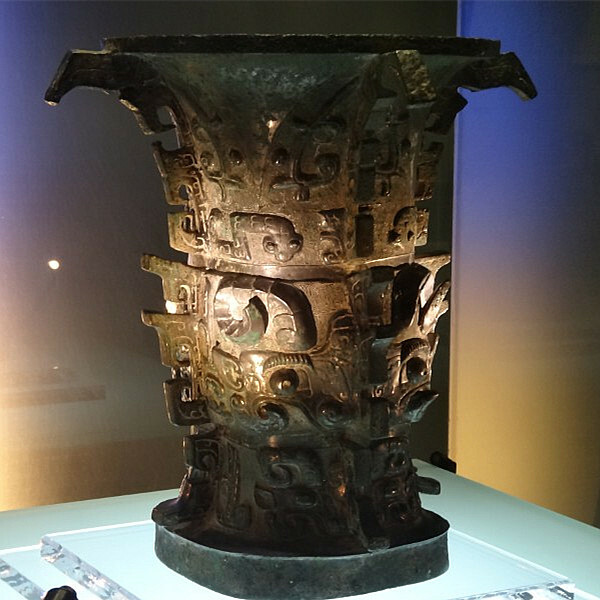 This is a bronze sculpture made around 800 BC, and is the oldest ancient Chinese sculpture with the words "Middle Kingdom" or "Zhong Guo" meaning "China" on it. It is a "Zun" sculpture, which is a kind of vase used to hold wine for pouring. The sculpture is 15 inches tall, and weighs about 30 pounds. There is writing on the inside in Chinese that talks about how the city of Louyang was built in China. The He Zun was found by a local farmer who did not know what it was, so he sold it to a waste recycling center where someone would have melted the sculpture down for the bronze metal. Luckily a historian saw it and rescued it, and then cleaned it up and put it in a museum.